This programme is the second part of two produced from a visit by the independent transport videos cameras in June 2012. Our filming begins at Karlsplatz where we see a number of the smart cream and blue Wiener Lokalbahen A G tramcars that work the interurban service from the spa town of Baden via the picturesque wine growing villages to the south of Vienna. We make a special feature of these trams on this programme. The older Lokalbahen A G cars are of SGP manufacture and the newer low-floor trams are produced by Bombardier. Arriving back at Karlsplatz, we continue around the ‘ring’ and film at various locations. Some of these locations are not covered in part one, such as Franz-Josefs-Kai on our way to Schwedenplatz. Here we board SPG E1 class 4801+1342 to the suburb of Friedrich Engels-Platz on route 2 savouring the sights and sounds of these classic tramcars. We then ride on similar E1 class 4740+1372 on route 2 returning to Schwedenplatz. Our next location is the pretty Wien WolfganggasseWiener Lokalbahnen A G. Here we film the action of the trams passing through before boarding SPG AM8 number 4-103 on a journey to Karlsplatz. The next location is Schwarzenbergplatz before we finish our 2012 visit to Vienna by travelling on two Rotax E1, and two SPG E1 class trams around the ‘ring’ on both route 1 and route 2. A fitting end to a visit to this beautiful city with a tram system to match! 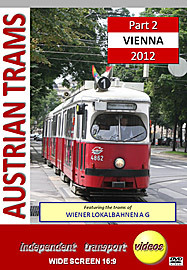 The present tram system in Vienna is run by the city owned Wiener Linien and is the largest European tramway system outside of the former Soviet Union. Vienna has a mixture of old and new suburbs most of which are served by the tramway. The system is mostly street running although there are a number of sections that run underground and connect with the U-Bahn. There is the specially branded Ring Tram that starts form Schwedenplatz and makes it way around the ‘ring’. The current fleet is made up of ‘E1’ and ‘E2’ class articulated cars – mostly with a trailer car. These cars are of the German Düwag design made in Austria under licence by Lohner, Rotax and SGP. The latest low floor cars are the ULF (Ultra Low Floor) which have been developed for the Vienna network. The first examples have been in service since 1995. At the time of filming there were over 200 of these cars in service, although the ‘E1’ and ‘E2’ class still dominate the scene. These will eventually be replaced by the ULF.